Soooooooooo, my original plan was to to design a simple December calendar. But, this craziness happened instead. Oops! I'm definitely a pen-and-paper kind of person and I know for a fact that I'm not the only one, especially around this time of year when everyones schedules are packed to the brim and the weeks fly by at the speed of light. Getting organized is important right now if you're the type of person that likes to at least feel like you have all your sh*t together. This planning pack is pretty much all you need to get your gifts, recipes, and shopping in check. Yes, we can technically use scrap pieces of paper or post-its to jot all this stuff down, but why not do it on something that looks festive and... dare I even say... adult?! - Cover page: in case you really want to be an over-achiever and create a little binder or something. - December calendar: so you can freak out about how many days you have left to order standard shipping versus express. - Gift planner: print out as many copies as you need, depending on how generous you feel this year. - Shopping list: because when you pull this baby out at Target people will say, "damn, this lady is on point AF." - Recipe log: to channel your inner domestic diva... with spaces for appetizers, drinks, main dishes, side dishes, desserts, and notes (ahem, in case one of your guests has any dietary restrictions). - Note sheet: because maybe you want to jot down some gift ideas as they come to mind. Or promo codes for online shopping. Or the fact that you need to remember to breathe here and there. 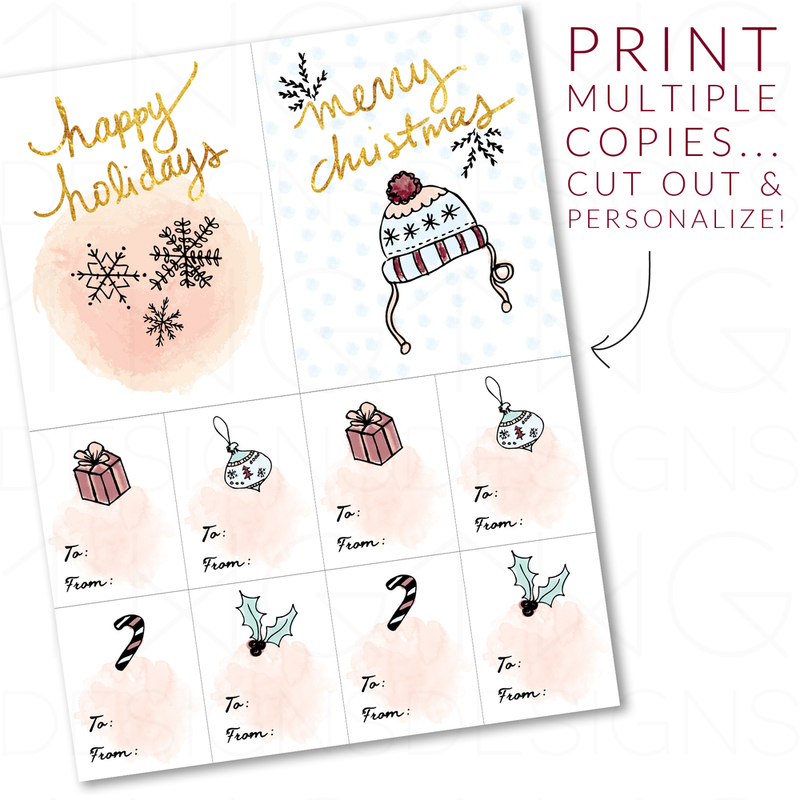 - Greeting cards & gift tags: so you can print out as many copies as you like (card stock paper would be best), cut along the lines, and personalize! Punch a hole in the gift tags to hang them from a ribbon on presents, and write a note on the back of the greeting cards. Let me know if you end up using these & thanks for stopping by!